Two colour bead sort with attribute or category already given. The first exposure to sorting for my toddlers. Sorting is an important foundational skill requiring reasoning, logic and mathematical thinking. 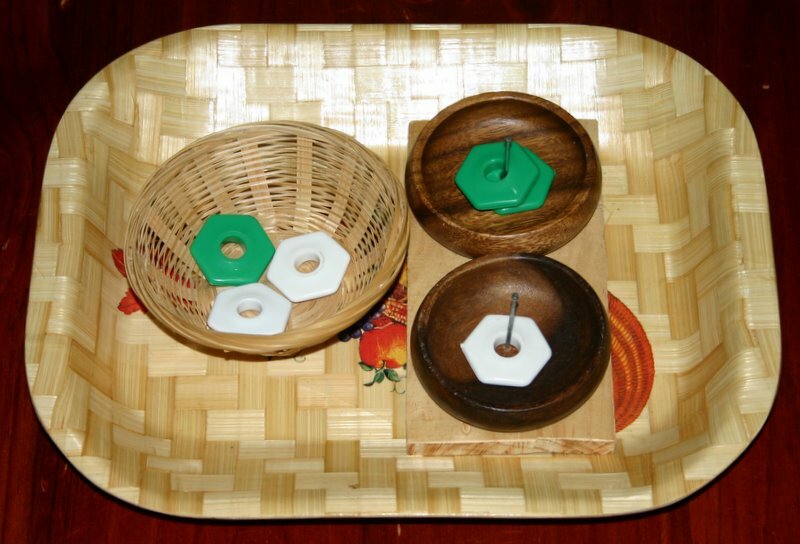 It enables children to be able to look at a group of objects and identify similarities and differences and to make logical decisions as to how to categorise the objects. Sorting skills will transfer into other academic subjects such as science and mathematics later in life. 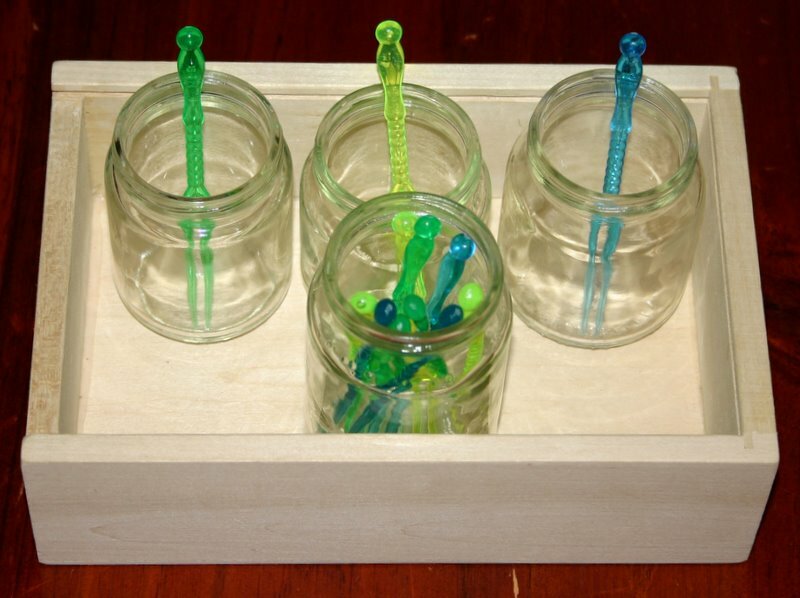 Sorting frequently covers other basic skills such as colour recognition and counting and if combined with some kind of transfer tool such as tongs, spoons, tweezers or scoops, will develop fine motor skills at the same time. I usually tape a peg to the top of each container to designate the attribute category until the child is able to determine a category independently. 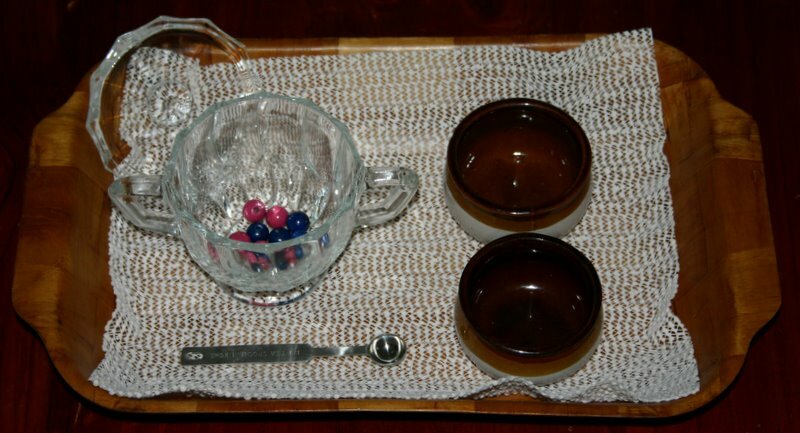 I present sorting to my toddlers with only 2 categories to begin with, in the form of a Montessori style tray activity. In other words, only 2 attributes are present. These attributes could be the colour of the object, the shape, size, length or thickness etc. but whatever it is, there are only 2 possible ways to sort them. 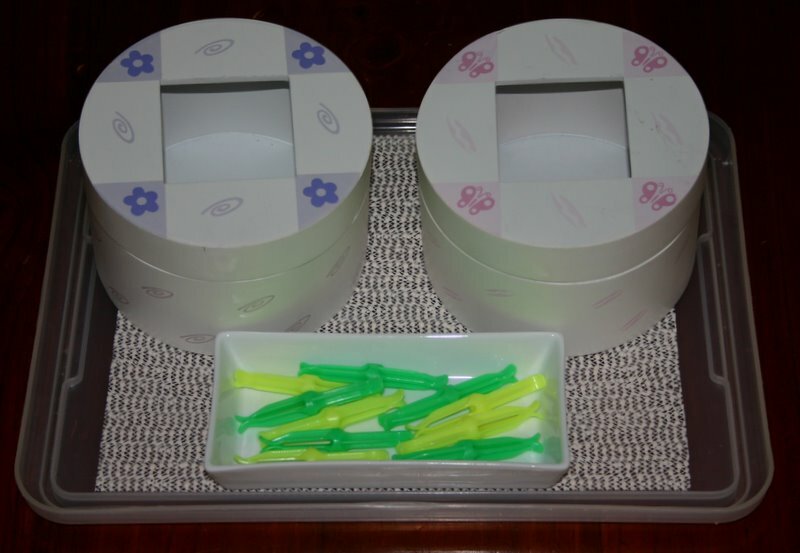 I also tape or glue one of each kind of object to the sorting container so it is essentially a matching activity as well as sorting for their first experience. Once they are able to look at the objects (in this case beads) and identify the similarities (all beads of the same size and shape) and differences (colour) they are ready to sort according to the attribute they have identified without a pre-determined category to guide them. We talk about the objects; what they are, what colour, size, shape etc and focus on what is the same and different about them. I then sort the first few objects (talking about their attributes) while the child watches and ask them to see if they can tell why I am separating them as I am. If they are able to tell me, I ask them to see if they can sort the rest or simply explain why I have sorted as I did and demonstrate further before asking them to have a go. Once they are able to sort by the two attributes with a category already given (one of each object taped to the container) I present two attribute sorting again without the categories already chosen and help the child to identify the two attributes themselves and sort accordingly. An example of 3 category/attribute sorting. Generally colour is an easy way for toddlers to sort as a beginning skill. More abstract attributes can be introduced later. After they have mastered sorting 2 attributes with a variety of objects, I extend the possible attributes or categories to 3, 4, 5 or more attributes, until they are able to sort any objects set before them and justify their reasoning. 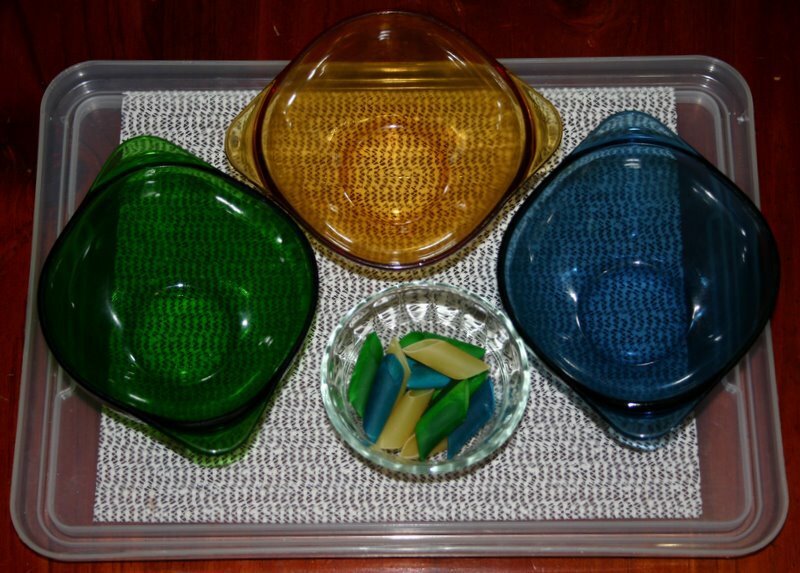 In this example the coloured bowls determine the category or attribute so it doubles as a matching activity also.